Centre for Health Economics, University of York, York. Department of Economics and Related Studies, University of York, York. Personal Social Services Research Unit, London School of Economics and Political Science, London. Background The UK government introduced two financial incentive schemes for primary care to tackle underdiagnosis in dementia: the 3-year Directed Enhanced Service 18 (DES18) and the 6-month Dementia Identification Scheme (DIS). The schemes appear to have been effective in boosting dementia diagnosis rates, but their unintended effects are unknown. Aim To identify and quantify unintended consequences associated with the DES18 and DIS schemes. Design and setting A retrospective cohort quantitative study of 7079 English primary care practices. Method Potential unintended effects of financial incentive schemes, both positive and negative, were identified from a literature review. A practice-level dataset covering the period 2006/2007 to 2015/2016 was constructed. Difference-in-differences analysis was employed to test the effects of the incentive schemes on quality measures from the Quality and Outcomes Framework (QOF); and four measures of patient experience from the GP Patient Survey (GPPS): patient-centred care, access to care, continuity of care, and the doctor–patient relationship. The researchers controlled for effects of the contemporaneous hospital incentive scheme for dementia and for practice characteristics. Results National practice participation rates in DES18 and DIS were 98.5% and 76% respectively. Both schemes were associated not only with a positive impact on QOF quality outcomes, but also with negative impacts on some patient experience indicators. Conclusion The primary care incentive schemes for dementia appear to have enhanced QOF performance for the dementia review, and have had beneficial spillover effects on QOF performance in other clinical areas. However, the schemes may have had negative impacts on several aspects of patient experience. DES18 ran from April 2013 to March 2016.4–6 It supported a proactive and timely approach for assessing patients considered at risk of developing dementia, and then testing them as appropriate. DES18 also aimed to improve support for individuals who were newly diagnosed with dementia and their carers by referring them to specialist services and offering a care plan or a carer health check. DIS ran from 1 October 2014 to 31 March 2015 and was designed to support and complement DES18.7,8 The aim was to encourage GP practices to adopt a proactive approach in identifying patients with dementia and, working with their clinical commissioning groups (CCGs), to develop relevant services and care packages. Like DES18, this involved identifying at-risk patients, working with care or nursing homes to find symptomatic patients, and offering them a dementia assessment to improve the recording of dementia on the practice’s dementia register and hence to improve care. 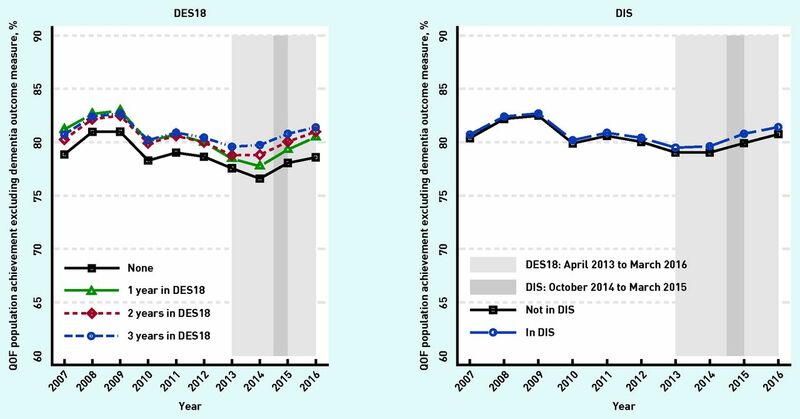 DES18 and DIS appear to have boosted diagnosis rates,9 but the unintended effects (positive or negative) of the schemes are unknown. Incentive schemes can unintentionally impact on other aspects of patient care; for example, by diverting clinical and administrative resources away from core and/or unincentivised services or conditions.10 The aims of this study were to test the effects of these schemes on quality measures from the Quality and Outcomes Framework (QOF) and on patient experience. A literature review was conducted to inform the researchers’ selection of unintended effects (positive or negative) of the two primary care incentive schemes. The search was restricted to UK studies of incentive schemes in primary care that were published between 2006 and 2016. The authors searched MEDLINE, Embase, PsycINFO, CINAHL, and HMIC. A previous evaluation of two primary care schemes for tackling underdiagnosis in dementia demonstrated that the schemes had been effective in terms of their intended effects, but their unintended consequences are unknown. This study addresses that gap in the evidence base. The researchers show that the schemes are associated with higher-quality care both for dementia and for other long-term conditions, but that some aspects of patient experience may have been adversely affected. Feedback from the GP Patient Surveys could help practices to identify and mitigate adverse effects. This retrospective cohort quantitative study was conducted on primary care practices in England. The cohort was a balanced panel, so all practices contributed data in all 10 years of the study from 2006/2007 to 2015/2016. A list of the datasets used to construct the dependent and explanatory variables is provided in Box 1. ↵b Method of GMS data collection changed 2015–2016 and data are missing for around 15% of practices. ADS = Attribution Dataset. CCG = clinical commissioning group. DIS = Dementia Identification Scheme. GMS = General and Personal Medical Services dataset. GPPS = GP Patient Survey. HES = Hospital Episode Statistics. IMD = Index of Multiple Deprivation. LSOA = lower-layer super output area. ONS = Office for National Statistics. QOF = Quality and Outcomes Framework. Five patient-focused measures that could be captured from available data were selected from the 12 potential unintended consequences. These domains are detailed in Box 2 along with the measures used to evaluate the effects of DES18 and DIS. How good was that GP at involving you in decisions about your care? How good was your GP at listening to you? DES18 = Directed Enhanced Service 18. DIS = Dementia Identification Scheme. QOF = Quality and Outcomes Framework. Domain 1: The researchers used two measures of practice performance from the QOF data to evaluate the schemes’ impacts on the quality of care outside of the schemes. The first measure aimed to investigate the impact of participation in the dementia schemes on the quality of care for long-term conditions other than dementia. In theory, this effect could be negative, for example, diverting a practice’s resources towards dementia assessments could adversely impact the quality of care in other areas; or it could be positive, in so far as better organised practices might perform well on both the dementia schemes and on QOF. The second measure was used to assess the impact of the schemes on the dementia annual review for existing patients. It is plausible that attention could be focused on newly diagnosed patients at the expense of those with an existing diagnosis (negative effect); alternatively, increased resources for dementia could have beneficial spillover effects on existing patients. The authors did not assess the impact on the QOF indicator for incentivising tests for reversible dementia in newly diagnosed patients, as better-quality post-diagnostic care is an intended effect of the schemes. Domains 2 to 5: patient experience domains included patient-centred care, access to care, continuity of care, and the doctor–patient relationship. The measures in these domains were constructed from the GP Patient Survey (GPPS). The rationale for including these indicators is similar to that of the first quality measure: that the impact of participation in the dementia incentive schemes on other patient experiences of, and access to, primary care could be either negative or positive, depending on how practices managed their resources. The researchers’ key explanatory variables were practice participation in the incentive schemes. For any particular year in which DES18 was active, a practice was defined as a participant if it provided data on the number of dementia assessments conducted that year. Even practices that recorded zero assessments were counted as DES18 participants, because they had engaged with the incentive scheme by signing up for the scheme, for which they were paid, and by reporting data. NHS England provided data on practices that participated in DIS, which was based on information collected by Local Area Teams for payment purposes. As other factors may impact practices’ outcomes, the researchers adjusted for a range of practice characteristics: the proportion of patients aged ≥65 years; the practice list size; the proportion of patients living in the 20% most deprived small areas; the proportion of patients in urban areas; the number of full-time equivalent GPs per 1000 patients (in deciles); and whether practices had a General and Personal Medical Contract. The Office for National Statistics (ONS) provides data on the Index of Multiple Deprivation score and rural–urban classification for small areas known as lower-layer super output areas (LSOAs). These were attributed to practices as weighted averages of the proportions of registered practice patients in each LSOA. A variable to capture dementia screening activity in local hospitals (a ‘hospital effort’ indicator used in a previous study9) was also included, based on one of the Commissioning for Quality and Innovation Framework (CQUIN) schemes.37–39 The researchers also accounted for regional characteristics (CCG). National practice participation rates in DES18 and DIS were 98.5% and 76% respectively. In total, 7079 practices were included in the study sample. Table 1 shows the number of practice-years within each participation group. 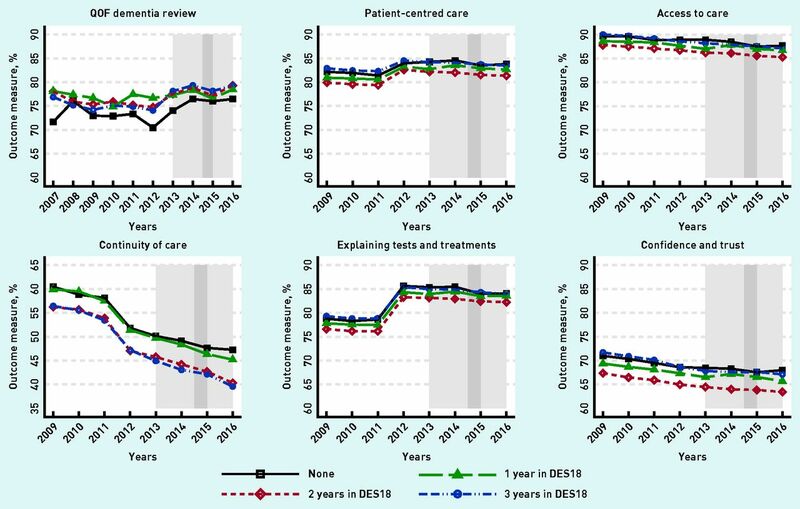 Sample statistics are presented in Table 2, and Table 3 summarises the DIS and DES18 policy effects on the quality of care and on patient experience. Results of the analysis of effects on the composite measure of care quality for long-term conditions in QOF (excluding dementia) are available from the authors on request. Figure 1 shows the trends of the mean QOF clinical composite measure (excluding dementia indicators). Figures 2 and 3 show the trends of the remaining measures. The formal tests (available from the authors on request) show that the pre-intervention time trends for the control and treatment practices are parallel at the 0.1% significance level. 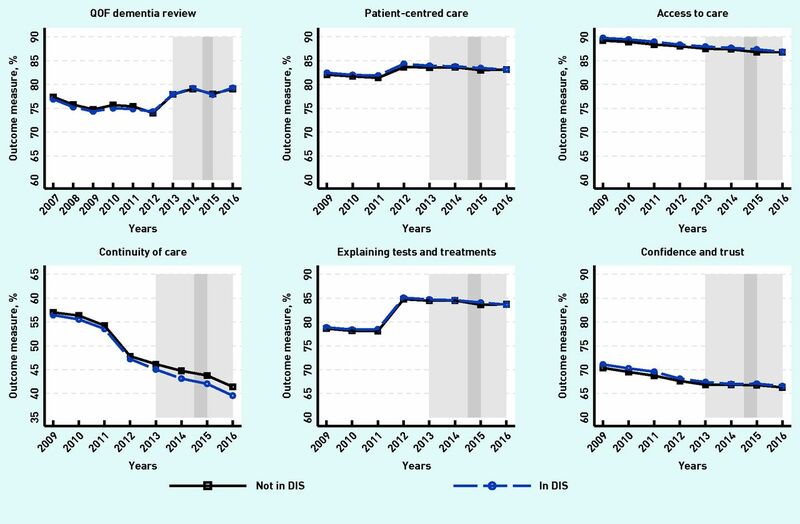 Trends in the quality of primary care for long-term conditions in QOF (excluding dementia): variation by participation in the schemes. DES18 = Directed Enhanced Service 18. DIS = Dementia Identification Scheme. QOF = Quality and Outcomes Framework. Light grey: DES18: April 2013 to March 2016. Dark grey: DIS: October 2014 to March 2015. Trends of outcomes for DES18 scheme. DES18 = Directed Enhanced Service 18. QOF = Quality and Outcomes Framework. Light grey: DES18: April 2013 to March 2016. Dark grey: DIS: October 2014 to March 2015. Trends of outcomes for DIS scheme. DES18 = Directed Enhanced Service 18. QOF = Quality and Outcomes Framework. DIS = Dementia Identification Scheme. Light grey: DES18: April 2013 to March 2016. Dark grey: DIS: October 2014 to March 2015. Practices that participated in either or both of the schemes to incentivise early diagnosis of dementia had significantly higher overall quality of clinical care compared with non-participants. Participation in DES18 and DIS increased practice achievement by 0.743 percentage points and 0.429 percentage points, respectively (Table 3). Participation in DES18 was associated with a statistically significant positive effect on practice performance on the annual dementia review, with participation in DES18 increasing practice achievement by 1.302 percentage points on average. Participation in DIS had no significant effect (Table 3). The schemes were associated with some negative effects on patient experience. Participation in DES18 decreased GPPS indicators of patient-centred care (−0.525 percentage points, 95% confidence interval [CI] = −0.755 to −0.296), access to care (−0.364 percentage points, 95% CI = −0.582 to −0.145), explaining tests and treatments (−0.371 percentage points, 95% CI = −0.620 to −0.122), and confidence and trust in the GP (−0.520 percentage points, 95% CI = −0.837 to −0.202), but had no effect on continuity of care, such as the ability to see their preferred clinician. Conversely, participation in DIS negatively impacted care continuity (−0.663 percentage points, 95% CI = −1.147 to −0.180), but was linked to improved patient experience with respect to one indicator of the doctor–patient relationship: explaining tests and treatment (0.265 percentage points, 95% CI = 0.006 to 0.525). Analysis by the researchers of the unintended consequences of the schemes revealed mixed effects. The schemes appear not only to have enhanced QOF performance in dementia review, but also to have had beneficial spillover effects on QOF performance in other clinical areas. This is possibly due to the use of extra funds attracted through the schemes to improve other areas of care at the practice; alternatively, it could be capturing practices’ organisational skills, such as the ability to comply with incentive schemes. Whatever the reason, it is reassuring that there was no adverse effect on either the annual dementia review or the quality of care for patients with other long-term conditions. However, the present study also uncovered some negative consequences. Analysis of the GPPS indicators identified deleterious effects for DES18 on several aspects of patient experience. For DIS, the only significant negative impact found was on continuity of care. A possible causal mechanism for each of these negative effects is that practices diverted efforts towards assessments for dementia, reducing the time available for other patients in a variety of ways, as described more fully in the data section. The major strength of this study was that it addressed a gap in the evidence base on the unintended effects of the incentive schemes for underdiagnosis in dementia. Comprehensive datasets were used covering almost all English general practices over a 10-year period. There are several reasons why the present findings on the effects on patient experience should be interpreted with caution. First, the GPPS data are derived from a small sample of practice patients and so may not be representative. Second, the impact on different types of patients, such as those with or without dementia, or their carers, is unclear. It is possible that patient experience may have improved for some types of patients. Third, the researchers did not control for other DES schemes, as data on uptake are not available. There are methodological weaknesses inherent in observational studies. Randomised controlled trials are considered the optimal study design for identifying causal effects as they control for known and unknown biases.40 However, DID is a good alternative method for non-experimental policy changes, such as the schemes evaluated in this study, if there are large numbers of observations (the schemes were national), if participation varies over time (as it did), and the dataset covers a reasonably long time-series. Although there was an extensive list of covariates to control for practice and regional characteristics, and hospital effort was included, there may be other confounders that could bias the present results. In addition, the authors could not test some potential unintended consequences due to lack of data. The present study indicates that the schemes could have had a small adverse effect on patient experience. Alongside the unintended effects, policymakers should also consider that the schemes had a positive impact on tackling underdiagnosis.9 Depending on the relative values placed on improving the diagnosis of dementia as opposed to the small negative effects on some aspects of patient experience, policymakers may consider this trade-off acceptable. Future evaluations of incentive schemes should include analysis of the unintended as well as the intended effects. Feedback from the GPPS could help practices to identify and mitigate any potential adverse effects of this nature. One potential area for future research is gaming (inappropriate exception reporting), which was highlighted in the literature review as a potential unintended consequence of QOF. There are no data to test whether practices assessed cases inappropriately in order to gain financially from the schemes, though qualitative work may shed light on this issue. There is also a risk of misdiagnosis, which can have ‘truly tragic consequences’,44 especially if doctors feel pressured into providing an early diagnosis. There are variations in the availability of post-diagnosis support between CCGs,45 which may be a response to higher diagnosis rates in areas where the incentive scheme had most impact. Policymakers could focus on monitoring future schemes and ensuring practices are supported to deliver sufficient high-quality post-diagnostic support. The authors would like to thank Kath Wright from the Centre for Reviews and Dissemination at the University of York for her support in completing the literature search. They are also grateful for feedback on an earlier draft of this article by attendees at the Health Economics Study Group (winter 2018, City University), and for comments from the project advisory group and from two referees. This article is based on independent research commissioned and funded by the National Institute for Health Research (NIHR) Policy Research Programme (Policy Research Unit in the Economics of Health and Social Care Systems: reference 103/0001). The views expressed in this article are those of the authors and not necessarily those of the NHS, the NIHR, the Department of Health and Social Care, arm’s length bodies, or other government departments. (2009) Living well with dementia: a National Dementia Strategy (London) https://www.gov.uk/government/uploads/system/uploads/attachment_data/file/168220/dh_094051.pdf (accessed 14 Feb 2019). (2014) Dementia UK: update, https://www.alzheimers.org.uk/download/downloads/id/2323/dementia_uk_update.pdf (accessed 14 Feb 2019). (2012) Prime Minister’s challenge on dementia: delivering major improvements in dementia care and research by 2015, https://www.gov.uk/government/uploads/system/uploads/attachment_data/file/215101/dh_133176.pdf (accessed 14 Feb 2019). (2013) Enhanced service specification: facilitating timely diagnosis and support for people with dementia (NHS), https://www.england.nhs.uk/wp-content/uploads/2013/03/ess-dementia.pdf (accessed 14 Feb 2018). (2014) Enhanced service specification: facilitating timely diagnosis and support for people with dementia (NHS England), https://www.england.nhs.uk/wp-content/uploads/2014/03/timely-diag-ppl-dementia.pdf (accessed 14 Feb 2019). (2015) Enhanced service specification: facilitating timely diagnosis and support for people with dementia 2015/16 (NHS England), https://www.england.nhs.uk/commissioning/wp-content/uploads/sites/12/2015/03/facilitate-tmly-diag-dementia.pdf (accessed 14 Feb 2019). (2014) Enhanced service specification: dementia identification scheme (NHS England), https://www.england.nhs.uk/wp-content/uploads/2014/10/dementia-ident-schm-fin.pdf (accessed 14 Feb 2019). (2014) Dementia identification scheme: guidance and frequently asked questions (NHS England), http://www.wmscnsenate.nhs.uk/files/7214/1596/6087/Dementia_Identification_Scheme_Guidance_and_FAQs_-_Gateway_02504.pdf (accessed 14 Feb 2019). (2018) Investigating the impact of primary care payments on underdiagnosis in dementia: a difference-in-differences analysis. Int J Geriatr Psychiatry 33(8):1090–1097. (2011) Effect of financial incentives on incentivised and non-incentivised clinical activities: longitudinal analysis of data from the UK Quality and Outcomes Framework. BMJ 342:d3590. (2011) The equity dimension in evaluations of the quality and outcomes framework: a systematic review. BMC Health Servs Res 11:209. (2007) Quality of primary care in England with the introduction of pay for performance. N Engl J Med 357(2):181–190. (2009) Effects of pay for performance on the quality of primary care in England. N Engl J Med 361(4):368–378. (2010) A review of the public health impact of the Quality and Outcomes Framework. Qual Prim Care 18(2):133–138. (2011) The Quality and Outcomes Framework (QOF): does it reduce health inequalities? (NIHR Service Delivery and Organisation programme), http://www.netscc.ac.uk/hsdr/files/project/SDO_FR_08-1716-207_V01.pdf (accessed 14 Feb 2019). (2008) Lessons from early experience with pay for performance. Dis Manage Health Outcomes 16(2):69–77. (2015) Pay-for-performance and primary care physicians: lessons from the UK Quality and Outcomes Framework for local incentive schemes. J R Soc Med 108(3):80–82. (2012) Pay-for-performance in the United Kingdom: impact of the quality and outcomes framework: a systematic review. Ann Fam Med 10(5):461–468. (2015) Does a local financial incentive scheme reduce inequalities in the delivery of clinical care in a socially deprived community? A longitudinal data analysis. BMC Fam Pract (16):61. (2009) Commentary: unintended consequences: what of quality outside the QOF? Br J Gen Pract, DOI: https://doi.org/10.3399/bjgp09X420644. (2008) GP pay scheme reduces care inequalities in deprived areas. Nurs Times 104(33):19–20. (2012) Patients’ views of pay for performance in primary care: a qualitative study. Br J Gen Pract, DOI: https://doi.org/10.3399/bjgp12X641438. (2013) Br J Gen Pract, Implementation of pay for performance in primary care: a qualitative study 8 years after introduction. DOI: https://doi.org/10.3399/bjgp13X668203. (2008) Effects of payment for performance in primary care: qualitative interview study. J Health Serv Res Policy 13(3):133–139. (2007) Impact of financial incentives on clinical autonomy and internal motivation in primary care: ethnographic study. BMJ 334(7608):1357. (2009) Pay for performance in primary care in England and California: comparison of unintended consequences. Ann Fam Med 7(2):121–127. (2016) Quality and Outcomes Framework: what have we learnt? BMJ 354:i4060. (2006) Pay-for-performance programs in the United Kingdom. N Engl J Med 355(17):1832. (2010) Research learning from the UK Quality and Outcomes Framework: a review of existing research. Qual Prim Care 18(2):117–125. (2010) Record rewards: the effects of targeted quality incentives on the recording of risk factors by primary care providers. Health Econ 19(1):1–13. (2018) GP Patient Survey: frequently asked questions, https://gp-patient.co.uk/weighted-data (accessed 10 Nov 2018). (2015) 2015/16 General Medical Services (GMS) contract Quality and Outcomes Framework (QOF): guidance for GMS contract 2015/16, http://www.nhsemployers.org/∼/media/Employers/Documents/Primary%20care%20contracts/QOF/2015%20-%2016/2015-16%20QOF%20guidance%20documents.pdf (accessed 14 Feb 2019). (2017) Quality and Outcomes Framework — prevalence, achievements and exceptions report: England, 2016–17, http://diabetestimes.co.uk/wp-content/uploads/2017/10/qof-1617-rep.pdf (accessed 6 Feb 2019). (2014) Changes to QOF 2006/07. http://www.nhsemployers.org/your-workforce/primary-care-contacts/general-medical-services/quality-and-outcomes-framework/archive-2006-2012/changes-to-qof-2006-07 (accessed 14 Feb 2019). (2017) Does quality affect patients’ choice of doctor? Evidence from England. Econ J 127(600):445–494. (2012) Commissioning for quality and innovation (CQUIN): 2013/14 guidance, https://www.england.nhs.uk/wp-content/uploads/2012/12/cquin-guidance.pdf (accessed 14 Feb 2019). (2014) Commissioning for quality and innovation (CQUIN): 2014/15 guidance, https://www.england.nhs.uk/wp-content/uploads/2014/12/sc-cquin-guid.pdf (accessed 14 Feb 2019). (2015) Annex A: Commissioning for Quality and Innovation (CQUIN) 2015/16 guidance templates for use with the NHS Standard Contract 2015/16, https://www.england.nhs.uk/statistics/wp-content/uploads/sites/2/2014/07/CQUIN-Guidance-2015-16-PDF-641KB.pdf (accessed 14 Feb 2019). (2011) in Oxford handbook of health economics, Econometric evaluation of health policies, eds Glied S, Smith PC (Oxford University Press, Oxford), pp 890–923. (2003) How much should we trust differences-indifferences estimates? Q J Econ 119(1):249–275. (2007) Generalized least squares inference in panel and multilevel models with serial correlation and fixed effects. J Econom 140(2):670–694. (2009) New developments in econometrics: lecture 11 difference-in-differences estimation (Cemmap lectures; UCL), https://www.cemmap.ac.uk/resource/id/imbens_wooldridge/slides_11.pdf (accessed 14 Feb 2019). (2014) An open letter to Simon Stevens, NHS chief executive, and Alistair Burns, national clinical lead for dementia. BMJ 349:g6666. (2015) Prime Minister’s challenge on dementia 2020, https://www.gov.uk/government/uploads/system/uploads/attachment_data/file/414344/pm-dementia2020.pdf (accessed 14 Feb 2019).